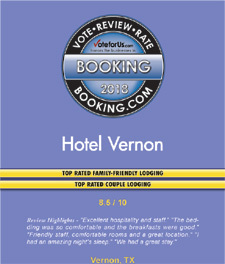 Welcome to the Hotel Vernon Inn! It’s all about location when you travel, which is exactly why our Vernon, TX hotel is conveniently close to some of the best recreation in the area. Whether you prefer fishing, boating, swimming, or golfing while on vacation; all of these options are easily accessible from our hotel in Vernon, TX. Start your morning with our free, full hot breakfast which includes waffles, fruits, cereal & 100% Arabica coffee. A hearty American breakfast is just what you need before a day of soccer or checking out local events. Let us take care of the most important meal of the day with a restaurant onsite. With Brantley Helicopter and other top businesses in town, our Village Inn Vernon, TX hotel is a home away from home for business travelers. We also welcome medical patients and those visiting loved ones at the Vernon State Hospital. From leisure to business, we know that there are many things bringing guests to this part of the Lone Star State, and you can rest assured you’ll receive the best in southern hospitality. Orbison Park is a short drive away and a favorite destination for outdoor lovers. However, if it’s the Texas Youth Commissions Association that brings you to town, you’ll also only be a few minutes away. Boating is a popular pastime here. On the other hand, for guests who prefer to simply relax on vacation, we specialize in that at our Vernon, TX hotel. Enjoy adjoining rooms perfect for larger groups and plenty of truck/RV parking. Campers, truckers and road trippers especially enjoy the cool rooms and peace and quiet at our property. 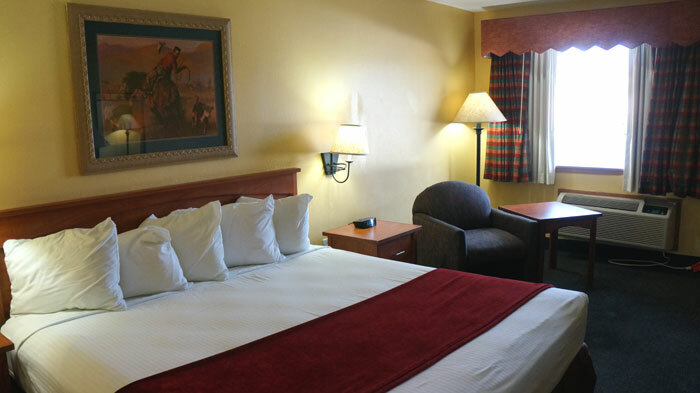 Whether you’re in town for a meeting with Texas A&M® Lockett Research or making your way out of state, you deserve a room that’s comfortable. West Texas Utilities® OK and Wright Brand Foods® are a couple of local companies that bring out of towners to our Vernon hotel. Waggoner Ranch is another top employer. Texas Lawyers for Texas Veterans TLTV is a State Bar of Texas program started in 2010, by the State Bar President, Terry Tottenham, to develop pro bono legal clinics throughout the state for military veterans who otherwise cannot afford or do not have access to basic legal services. The TLTV initiative, through the work of local bar associations, legal aid groups, and volunteer attorneys across the state, has helped to address this need by providing free legal assistance to veterans. The Santa Rosa Roundup will be held on Wednesday, May 15th – Saturday, May 18th, 2019 in Vernon, Texas. This Vernon rodeo is held at Santa Rosa Roundup and hosted by Beutler & Son Rodeo Co.
Activities : Whatever you love, it lives here! Here are some uniquely Texan things to see and do. When you find something that sparks your interest, just add it to your Texas passport. Attractions : Below our rugged exterior, you'll discover Texas has an air of sophistication. For every cowboy you find, there's an art aficionado to match. Sometimes, they're even one and the same. Not only are we big into art, but we have an astute taste for opera, theater and classical music. Golf : Hillcrest Country Club. We have one of the best 9-hole golf courses in the area with a variety of special events in addition to ordinary golfing activities. Golf in Texas is a year-round sport. We have rental carts available as a convenience and can also provide cart storage for members for a reasonable monthly charge. The Hillcrest Golf Association sponsors tournaments and golfing events throughout the Spring and Summer months. Hospitals : Wilbarger General Hospital: QUALITY HEALTHCARE SERVICES IN VERNON, TX No matter what illness or sickness you or a loved one has, we aim to be your number one healthcare provider. Shopping : Sometimes, shopping is the biggest adventure of all. While you won't find a cookie cutter mall here, you will find VARIETY of shopping opportunities. Relax and browse through our unique, one-of-a-kind family owned stores - with everything from antiques to the latest trends, there is something for everyone here. University :Vernon College. Vernon College is a fully accredited, comprehensive community college offering academic, career and technical education programs, as well as community classes to prepare students for employment or for successful transfer to a four-year college or university.